This ARC was provided to me for free. Summary: This book is the second book in the series The Illuminae Files. Thus, this review will contain spoilers for the first book, Illuminae. You can read my review for that one here. Gemina picks up just after the end of Illuminae, with the Hypatia racing towards Jumpstation Heimdall after the mutual destruction of the UTA vessel Alexander and the BeiTech ship Lincoln, as well as the rescue of Kady Grant. Heimdall is essentially shutting down for a long holiday as well as some wormhole maintenance, leaving behind a skeleton crew that includes the station captain and his daughter, Hanna Donnelly, and her boyfriend, Jackson Merrick; Chief Engineer Isaac Grant (yes, Kady's father); and the members of the Malikov crime family, including drug dealer Nik and his elite hacker cousin Ella. Unfortunately, also joining them for this long holiday is a mercenary BeiTech clean-up crew, hoping to intercept the Hypatia to destroy any remaining evidence of the Kerenza invasion in addition to everyone remaining at Heimdall as well. Hanna, Nik, and Ella find themselves at the center of a dangerous situation as they try to defend the station and protect the lives of the crewmembers on board, all while the unstable wormhole is threatening to destroy the universe anyway. As with Illuminae, this story unfolds through a dossier of chat logs, diagrams, journal entries, surveillance footage transcripts, etc. Thoughts: Oh. My. God. This book messed me up. It REALLY messed me up, and in a different way from Illuminae, too. Oooooooh, BeiTech, you been a BAD, BAD BOY. Or rather, I suppose the responsibility for all of this comes from Leanne Frobisher, whom we discovered at the end of Illuminae is Ezra Mason's abusive, psychotic mother and also the Director of Acquisitions for BeiTech. The squadron that she sends in, helmed by Travis Falk, aka Cerberus, is ruthless and bloodthirsty. The whole situation is rather terrifying, and that's even without considering the ramifications of a faulty wormhole and universe-ending paradoxes. And ALSO, you know how there was the Phobos virus in the first book? I feel like the biological evil in this book is SO MUCH WORSE - creepy, slimy creatures with four mouths that burrow into your body and attach themselves to your hypothalamus. I shuddered reading every single scene that they were in. So gross. SO GROSS, Amie and Jay!!!! If you loved the drama of the first book, it's definitely here in spades, and if you like space and theory and all that stuff, it's definitely here in, uh, greater spades? I'm not going to lie, some of it went over my head a little bit (essentially, I am Ezra Mason in this book), but it's explained enough ways that I understood what was happening eventually. But gosh, this book packs a wallop of a punch in terms of the science stuff. And if you loved Kady, Ezra, and AIDAN, they definitely appear in this book too. It's not about them, but it's great to know that the characters we grew to love show up again as well, in all their glory. Hanna and Nik are interesting characters, and it's worth noting that while the story of "the princess" and "the criminal" has been done before in many books, it definitely doesn't feel old here. Hanna is the station captain's daughter, with a doting father and a large allowance, but she also is well-trained in war strategy and martial arts. She is fierce, clever, and heroic. Nik is tattooed, dresses in black, and probably reeks of cigarettes, but he's clearly got a heart of gold and carries a lot of weight on his young shoulders. Having met Amie Kaufman and Jay Kristoff twice now, and having heard them talk about the process of writing The Illuminae Files, I continue to applaud them for their dedication to the diversity of their characters, in ways big and small. Gemina contains a major character who is physically disabled and who is central to the story. Her disability is a part of who she is, but it isn't all that she is. (She's a badass, you'll LOVE her!) 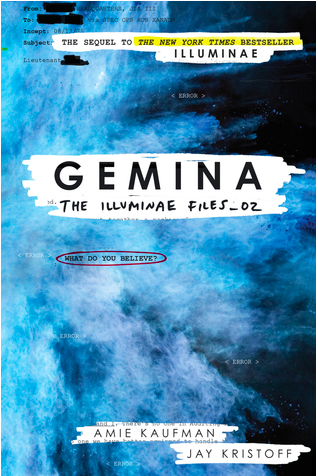 In addition, Gemina continues to identify major and minor characters, speaking and non-speaking, who come from different cultural backgrounds (identified by their names, which are not all Anglicized), and in the rare character photos, they also don't have uniform appearances (ironic, really, since they're wearing uniforms). There is a character with a Vietnamese name who has a short undercut style, which is really, really cool. Like, a punky Asian chick. The heavy brute force is split between male and female soldiers. There's a lot more I could say, but I don't want to spoil it. This book comes out in October, and I highly, highly suggest you pick it up when it comes out. I'm very near the end of the book, and it's very intense. The clock is counting down as Hypatia is nearing Heimdall, which could tear the universe into atoms, and the secondary fleet closing in, it's keeping me on my toes. Isn't it awesome??? It's intriguing in a way that definitely felt different from Illuminae.